If you use a full-frame lens on a smaller-format sensor, what happens to image quality? Does using only the centre of the lens field improve image quality or are matters relating to image quality more complex than this simplistic suggestion implies? When investigating the image quality that a lens delivers it is sensible to use the largest sensor that the lens can accommodate. The theory is simple: testing image quality over the largest area is both the best way to set a level playing field and also the most critical way to perform such a test. This ensures, for example, that a full-frame lens and an APS-C lens are both tested at the respective limits of their use. Conversely, it would be easy to criticise an image quality test that was based on tests performed using an APS-C sensor if the lens being tested were capable of covering a full-frame sensor. I am not a fan of assuming that common sense applies at the best of times but when it comes to looking at image quality our assumptions are sometimes so deeply ingrained that we don’t realise we’re making them! So what does “common sense” tell us about the results that should be expected from an APS-C sensor compared with those for the same lens determined using a full-frame sensor? Many people would, I think, say that the image quality expected on a smaller-format sensor would be at least equal to (and probably better than) the image quality obtained using a full-format sensor. This would be justified by the knowledge that only a more central part of the image field is being used and it is generally known that imperfections become more apparent at the more extreme reaches of an image field. Therefore, by avoiding the edges of the image field, image quality must surely be increased. A few people might suspect a rat in the very fact that the question is being asked; others might even have noticed the odd reference to image quality measurements using APS-C sensors as part of some of my What Digital Camera reviews of full-frame lenses, such as in the Group Test of fast 50mm primes earlier this year. So what have I found so far? The answer is based on a small sample so may not be definitive but this is the current state of play… Testing a full-frame lens on a full-frame camera, using the full image area to determine image quality, provides the baseline measurements; testing the same lens on an APS-C body generally produces a slightly lower level of image quality (see below) whereas testing the same lens on a full-frame body but using only the central area equivalent to that of an APS-C sensor seems to produce a slightly higher level of image quality. Sigma full-frame 15mm Fisheye lens tested on a full-frame Nikon D700 (red line, above) and a DX/APS-C Nikon D80 (black line, below). Data processed using Imatest analysis (www.imatest.com). You can read more about this particular lens test in the July issue of WDC, which will be published very shortly. The last of these observations is easy to explain, using the reduced image field argument, but the second requires more thought. I don’t have a definite answer (with proof) but the front runners, in my opinion, are sensor quality and image size. The former is based on the notion that larger sensors are probably more critically designed, tested and aligned when installed to give the best possible results; the latter is based on the fact that small pixels, as used in APS-C sensors, may get close to or fall below the Airy Disk size for the lens and prevailing aperture setting. Whatever the explanation, the trend has been observed on several occasions now and has never yet been refuted. 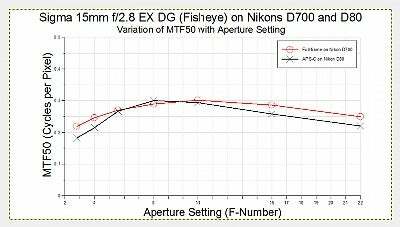 So the bottom line is this: if you want optimum image quality you should think seriously about buying not only full-frame lenses but also a full-frame dSLR. Or a dedicated micro-format digital system – but that’s for another time.